Thousands of revelers crowded into Rockefeller Center on a warm night Wednesday to watch the annual lighting of the world's most famous Christmas tree. Mayor Bill de Blasio flipped the switch to illuminate the 75-foot-tall, 12-ton Norway spruce with 50,000 multicolored lights and iconic Swarovski star, more than two weeks after the tree arrived in Rockefeller Plaza from State College, Pennsylvania. This year's lighting ceremony was broadcast on NBC affiliates around the country, featuring performances by Gwen Stefani, Seal, Jennifer Nettles, Train, Pentatonix and others. The tree will be lit every day from 5:30 a.m. to 11:30 p.m. until Jan. 7, except for Christmas Day, when it will stay lit for 24 hours. And this year will feature additional security in the wake of last month's truck attack in Tribeca. In addition to road closures and police barricades and checkpoints the night of the lighting, West 49th and West 50th streets will both be closed between Fifth and Sixth avenues for at least part of the day from Thursday to Jan. 2. The holiday tradition started in 1931. This year's tree is the 86th to sit over the Rockefeller Center rink for the weekslong display and the third from Pennsylvania in recent years. Angie Eichler said their family has come almost every year to see the Rockefeller Center tree - but she never dreamed it would be theirs. After the holidays, it will be milled into lumber for Habitat for Humanity. •	1931 – Construction workers building Rockefeller Center put up a Christmas tree, the first-ever Rockefeller Center Christmas Tree. 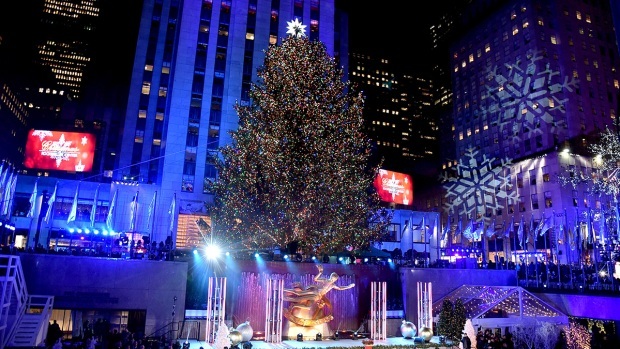 •	1933 - First formal Rockefeller Center Tree Lighting Ceremony. The tree was decked with 700 lights in front of the eight-month-old RCA Building. •	1936 - Two trees, each 70 feet (21.3 m) tall, were erected. For the first time the Lighting Ceremony included a skating pageant on the newly opened Rockefeller Plaza Outdoor Ice Skating Pond. 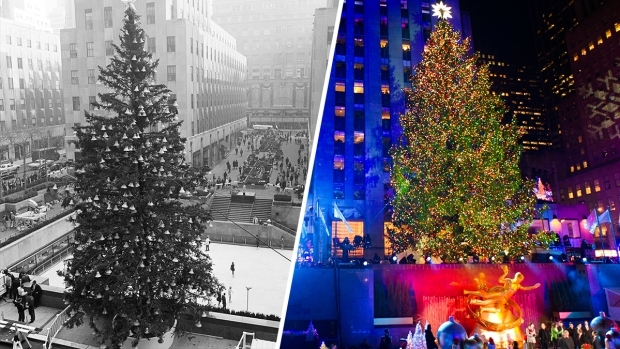 •	1942 - Three trees were placed on Rockefeller Plaza, one decorated in red, one in white and one in blue to show support for our troops serving during World War II. •	1949 - The tree was painted silver, to look like snow. •	1951 – The Rockefeller Center Christmas tree was lit for the first time on national television on the Kate Smith Show. •	1966 - The first tree from outside the United States was erected. It was given by Canada, in honor of the Centennial of its Confederation. 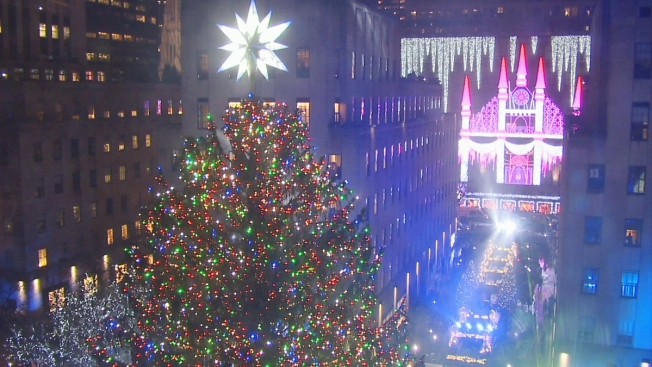 This is the farthest distance a tree has traveled to Rockefeller Center. •	1980 - For the 50th Anniversary of Tree Lighting, a 70 foot-tall (21.3 m) Norway Spruce came from the grounds of the Immaculate Conception Seminary of Mahwah, N.J. Bob Hope participated in the Lighting. •	1999 – The largest tree in Rockefeller Center history, 100 feet tall (30.5 m), came from Killingworth, Conn.
•	2004 – The Swarovski-designed star became the largest star to ever grace the tree. •	2007 – For the first time, the tree was lit with energy-efficient LEDs. They draw a fraction of the power that had been traditionally required by the tree, reducing energy consumption from 3,510 kwH to 1,297 kwH per day, saving as much energy as a single family would use in a month in a 2,000 square foot (185.8 m²) home. Hundreds of solar panels atop one of the Rockefeller Center buildings help power the new LEDs.